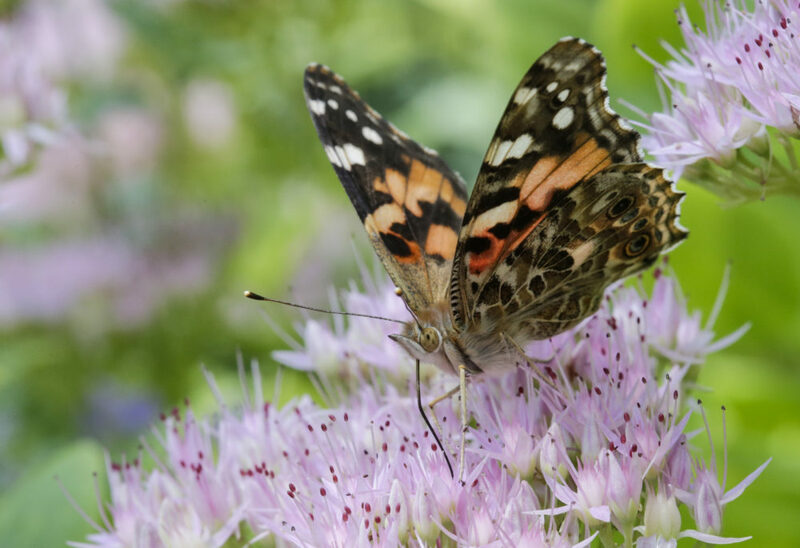 An unusually wet winter in Southern California has given way to a super bloom of wildflowers and an explosion of Painted Lady butterflies. The black and orange insects usually keep a low profile as they make their annual migration from the deserts of western Mexico to their breeding grounds in the Pacific Northwest. But this year, they're hard to miss. Scientists say that extra plant growth has allowed their population to boom into the millions. "The way I explain it to people, it's like being in a snow globe of painted lady butterflies," says Pat Flanagan, co-founder and CEO of the Encinitas-based non-profit Butterfly Farms. "Between the super bloom and the butterflies flying through last weekend out in our local desert, that was one of the most spectacular days I've ever had out there." "Here in San Diego, we can have years of just a couple inches of rain, even out at the coast. And our deserts, while quite beautiful, are exceptionally dry and can see only a couple of inches in the entire season. Well, we have places in our desert that saw year totals in one day ... so we had a very exceptionally wet weather event this winter and the plant world has responded and when the plants take off like that, then we see the explosions of insects." "While everyone's out enjoying the butterflies the last couple weeks in California, ... We can't lose sight of the fact that our monarch population, we just received our numbers from last November's count, that we were down 86 percent on the previous year's monarch count. So our butterfly populations are declining. We can't lose sight of the fact that there's so much work to do." "What anyone can do to get involved — especially with monarch issues — is plant habitat. And [a] habitat for monarch butterflies is milkweed. It's a plant that was hard to find 20 years ago, but it's much much easier to find now. Almost anybody can call around and find milkweed that's appropriate for their area. Plant it in your garden, monarch butterflies will come, [and] they'll reproduce. Go to your garden center, get milkweed, plant it in your garden and help the monarchs." Savannah Maher produced this interview, edited it for broadcast with Todd Mundt.